The other week, a new website on the history of the book was launched by Johanna Drucker: History of the Book. Coursebook. Apart from the 'Coursebook', there are sections for 'Exhibits' and 'Gallery'. 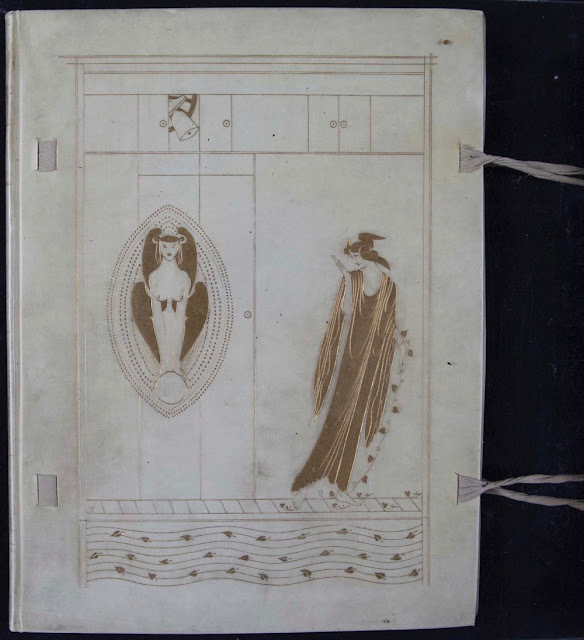 Included in the 'Exhibits' are several examples from the vast collection of the William Andrews Clark Memorial Library that holds exceptional material on Wilde, and on Ricketts and Shannon. 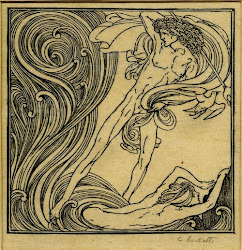 There is an image of a Sybil Pye binding for the pre-Vale publication Daphnis and Chloe (1893). 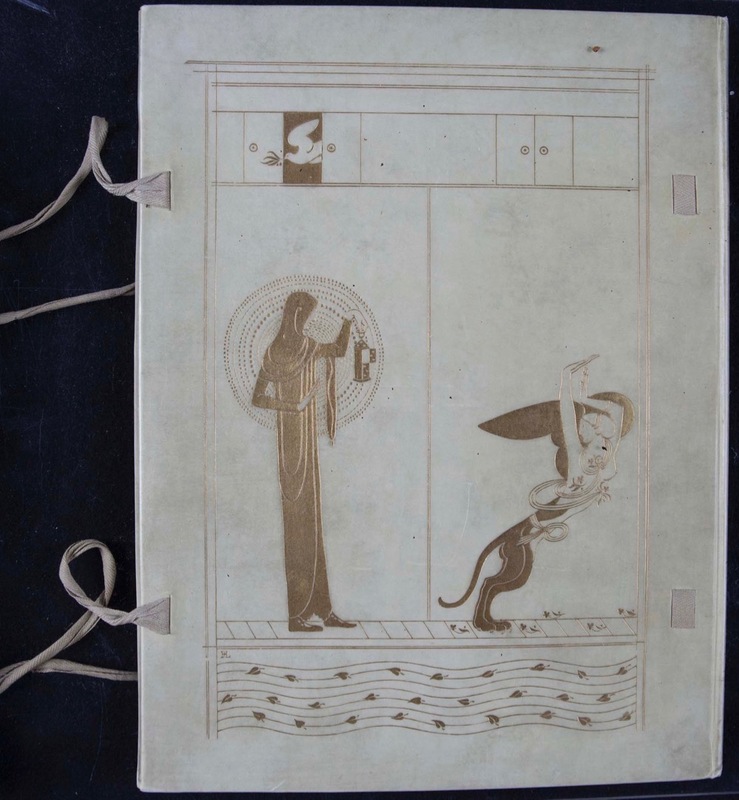 The binding is in black pigskin, inlaid with red niger and undyed goatskin, and gold-tooled (as described by Marianne Tidcombe). This binding was ordered by G.F. Simms and acquired by the library in 1959. The cover mentions 'The Loves of Daphnis and Chloe', a title that doesn't occur in the book itself. Another example is in the 'British Aestheticism' section. This is a deluxe copy of Oscar Wilde's The Sphinx, with its extended design on the vellum covers (larger than the ordinary edition). There are only 25 copies, and this one still has the original fragile ties. Oscar Wilde, The Sphinx. 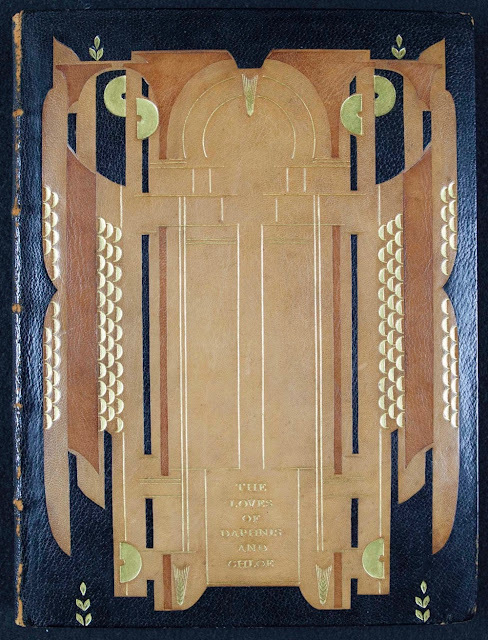 Binding design by Charles Ricketts. Deluxe copy: front and back of binding. A long appraisal of the book can be found in the section on 'Modern Art of the Book'. This essay on The Sphinx with more images is written by Kristin Cornelius Way. Thanks are due to Marja Smolenaars. Curator, Koninklijke Bibliotheek, National library of the Netherlands - Publications about Ricketts: "A new checklist of books designed by Charles Ricketts & Charles Shannon" (1996); "Butterfly, abstraction or flower? Another look at Charles Ricketts' design for The picture of Dorian Gray" (The private library; Winter 1998); "Charles Ricketts en de nieuwe Nederlandse boekkunst, 1890-1895" (Jaarboek voor Nederlandse boekgeschiedenis, 2000); "The construction of 'A house of pomegranates', or, Why 'unusually fresh' copies of Oscar Wilde's book are usual" (The private library, Summer 2005); [Review of: The Vale Press. Charles Ricketts, a publisher in earnest] (The library, December 2005); "The revival of a publisher's device. Charles Ricketts and Osgood, McIlvaine & Co." (The book collector, Autumn 2006); "Het private press-manifest als icoon. Over heruitgaven: de route van idealisme naar canonisering"(De gulden passer, 2012); "Tussen Jezus en Oscar Wilde" (Leeslint, december 2016) [to accompany the exhibition "Between Jesus and Oscar Wilde" in Museum Meermanno (October 2016-January 2017). Acted as publisher (At the Paulton) for 'Charles Ricketts's Mysterious Mother' (2016).